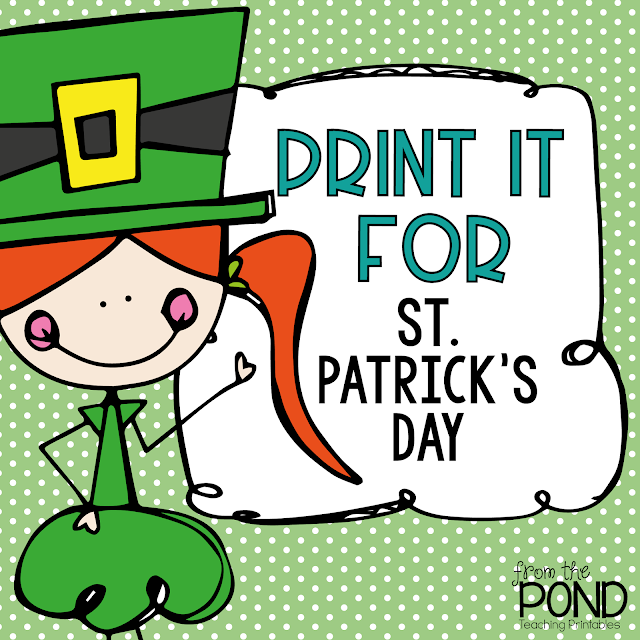 Need some fun printables for St Patrick's Day that will engage and motivate your little learners with solid education practice and skills? We have you covered! Here are two of our favorites! 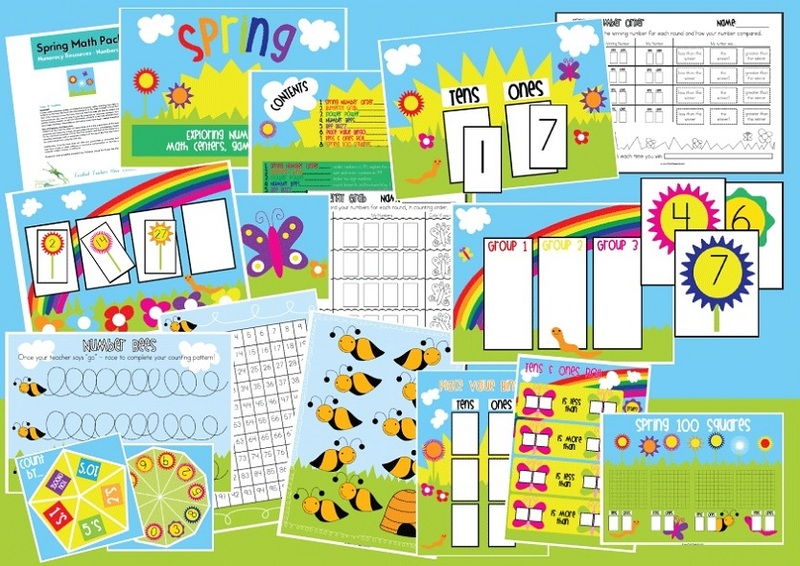 Print, cut and laminate the numeral strips. 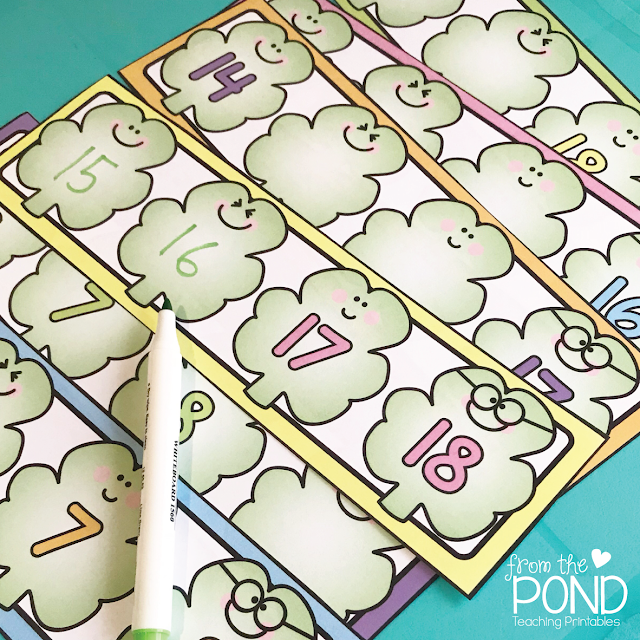 Ask your students to use dry erase markers to fill in the missing numbers! 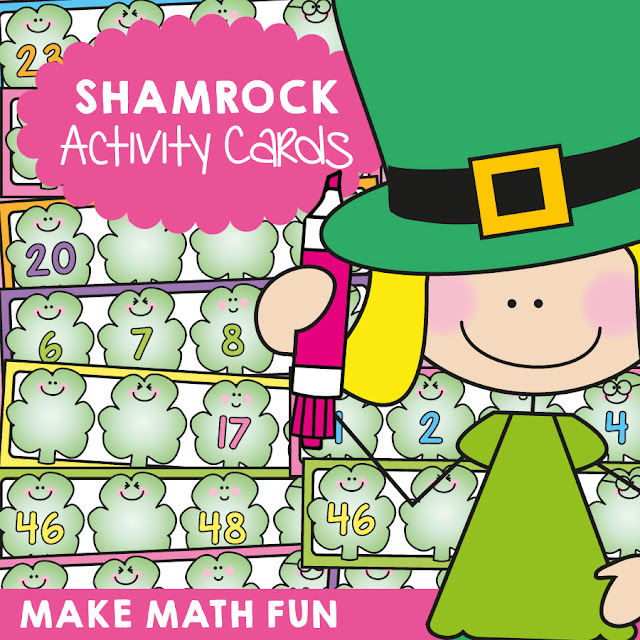 We listed this super colourful math center activity pack today also, it would be perfect for St Patrick's Day! Students will add and subtract numbers in the range 1-6. 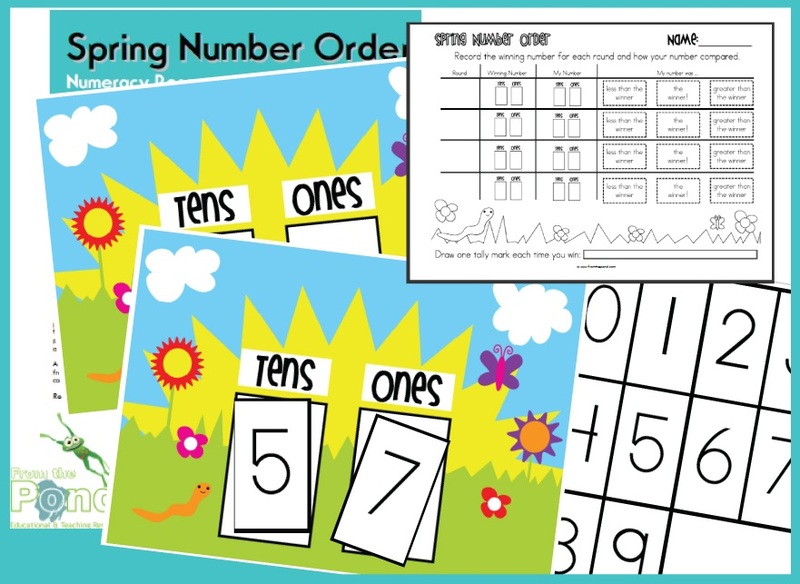 They will develop an awareness of number patterns and develop strategies for solving problems, other than counting by 1s. 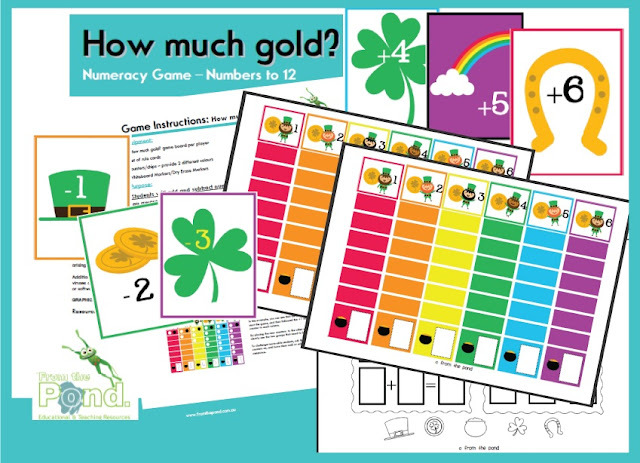 Included in the file are teaching tips, game instructions, a colorful game board (which will need to be laminated for each student, 12 game cards and a worksheet. 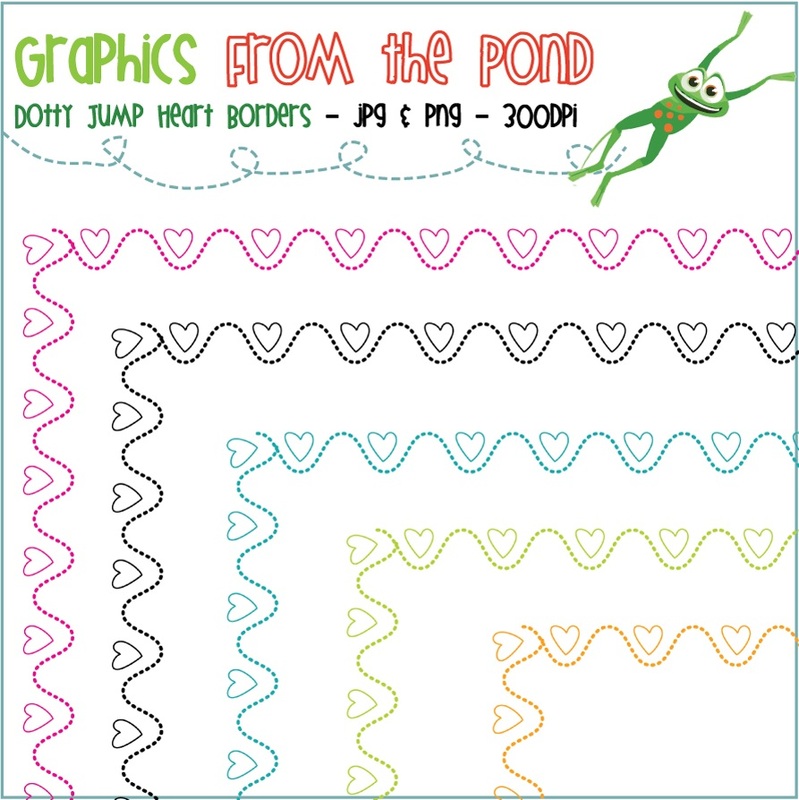 I have just listed these new graphics in our Graphics From the Pond store on TpT. It was a delight to put them together. 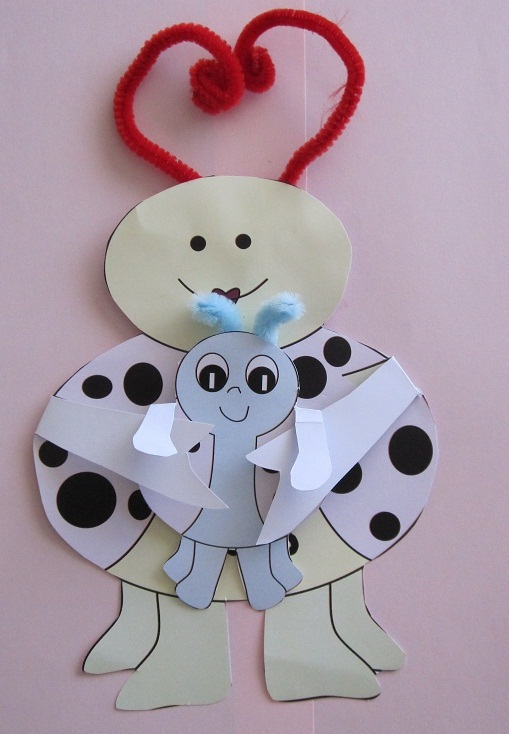 I have made each baby spring animal nice and round, to allow teachers to place content inside each one for games and centers. If you are using MS Word or something similar, just add a transparent text box and float it over the top of the graphic - then you can add words or numbers. 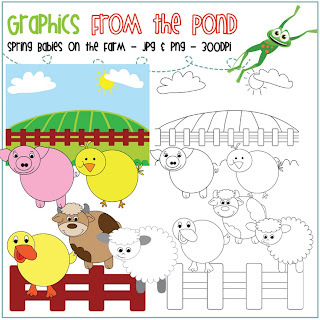 I created this Write the Room file using my new spring graphics, and am giving it away for free in my TpT main store. 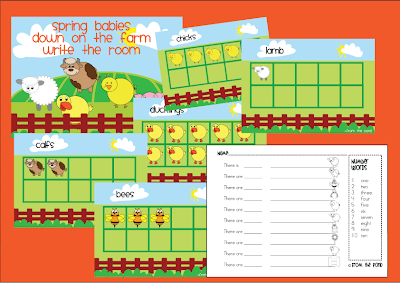 It will be good for helping your students to recognise ten frame arrangements for numbers 1 to 10 and also for reading number words and spring related words. I have had so much fun putting this packet of 8 center games together. 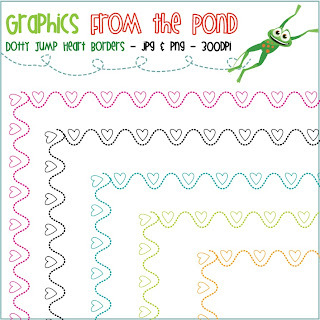 I have used all the digital graphic skills I have been exploring and teaching myself to make our latest collection of math games super special. I loved being able to keep a theme and colour selection running through the collection. The centers are for students that are exploring numbers to 99 and particularly place value. 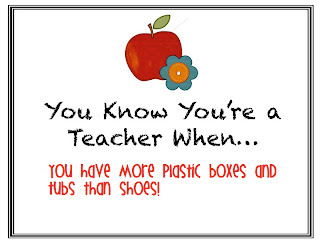 I am aiming to have a few more Spring packets released sooon, that focus on other areas of maths and literacy. I could not resist making one of the games totally FREE for you though - it is just one of the eight games that come in the packet. I hope you will find it useful - click on the image below to find it at TpT also. Today I spent some of Valentine's Day with my gorgeous little lady "Miss 4", who is so excited about the upcoming arrival of her baby sister or brother. She made me a gorgeous Valentine at preschool, and wrote "I love you Mum", it was very sweet. We talked about Valentine's Day and eventually played a game where we looked for as many red things that we could find in her toy room. 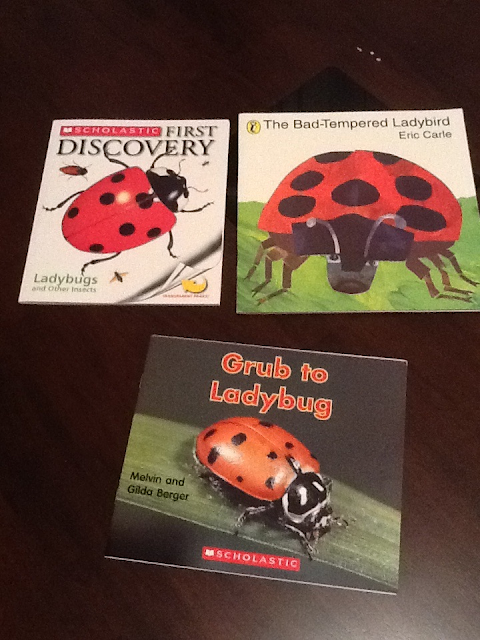 We also settled on some lovely ladybug story books (and non-fiction) to read - as let's face it, I am all in favour of lying on the lounge with my ever-expanding feet and ankles elevated - and reading books to my sweetie is perfect when lying on the lounge. The Bad Tempered Ladybird was her favourite. 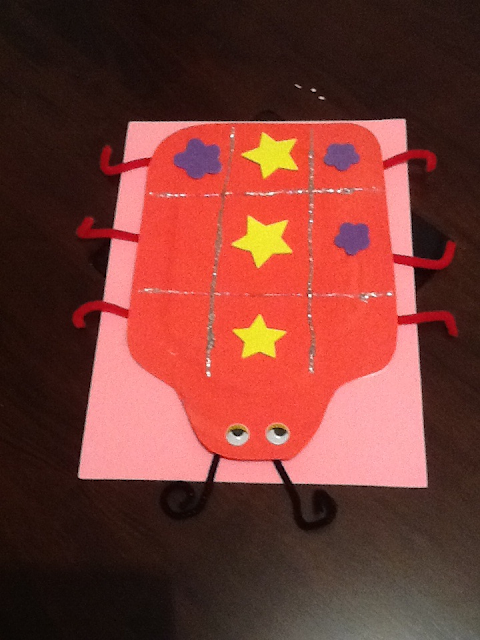 We made this giant Ladybug Tic-Tac-Toe game from a sheet of red card, and coloured paper. I run a preschool art class at my local church, and tomorrow we are playing this game ahead of making some individual smaller versions (see below). The lines were made with masking tape. My Miss 4 L-O-V-E-D winning at Tic-Tac-Toe and she beat me 4 games to 2! Here is a little version of the Tic-Tac-Toe game that we will make tomorrow at art class. 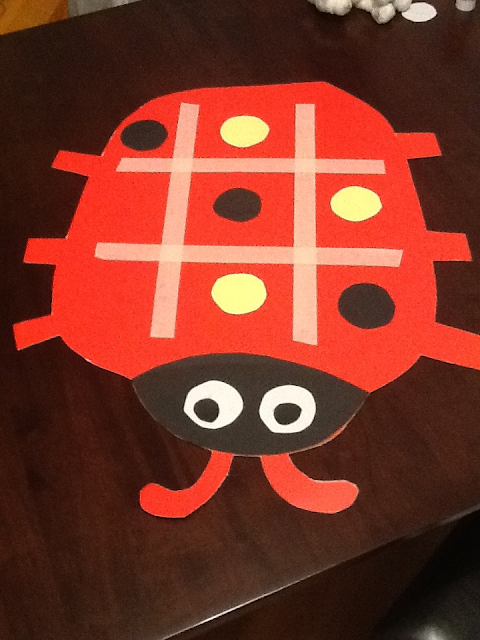 Hopefully the little-ones will have fun making their ladybug game and then playing the game with Mum or Dad. I cut the red shape from a foam sheet and have used glitter glue to draw the lines, pipe cleaners to make the legs, and sticky googly eyes. I stuck everything down at the back with masking tape and then glued the entire ladybug to another sheet of foam. I am giving the little ones foam shapes (flowers and stars) to use as "counters" for the game, as they are inexpensive. 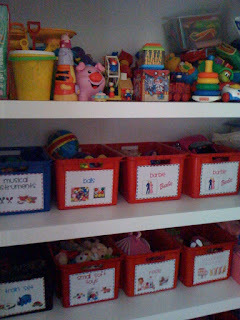 I'm joining in the Linky Party over at Kindergarten Lifestyle - what fun! Check out the board on Pintrest too! I must have around 300 - not kidding. 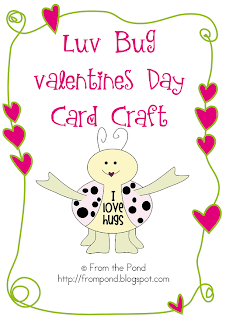 I have created this cute little card craft for Valentine's Day. You can download it for free HERE! After you have made a LITTLE LUV BUG, fold the arms, so that he is getting a lovely big Valentine's Day hug! This craft card would also be great for Mother's Day. I have included coloured versions, as well as black and white. 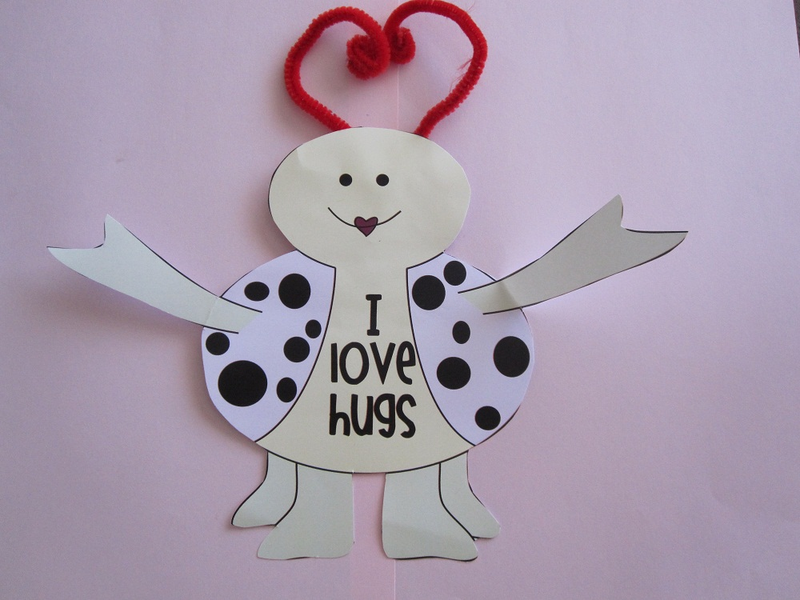 There are versions with "I Love Hugs" and plain ones as well! I hope your little ones enjoy creating this card to give to a favourite friend or family member! Hello blog friends - first let me say how excited I am - I just realised that we now have 328 followers! When did that happen - I have vague recollections at working hard to get to 100. Thank you, thank you, thank you, I appreciate each and every one of you! By the way, when I say "we", I am referring to my From the Pond partner husband Brett. He supports me so much - I find myself saying "we" all the time! He does a lot of cutting and laminating for me, and email correspondence on our eBay store. He is wonderful, and I admire how much he has supported me through this journey, right from when I explained why I was spending the first $77 to buy a laminator and some cardboard! Let's just say he doesn't ask anymore! What have I been up to? LOTS! I have recently started some leave from teaching, to have our second baby. I brought home all of my personal teaching belongings as I am not quite sure what I will be doing when I return in August. So......11 years worth of resources takes up a little bit of space. I have it all stacked in the garage at the moment, as I just have to clean and sort through all of it before I pack it away (I learnt that after my first lots of mat leave........grubby Kindergarten hands, leave grubby, sometime invisible marks on things, and then those grubby little marks sometimes grow......a wonderful scientific experiment in bacteria and mould I presume). 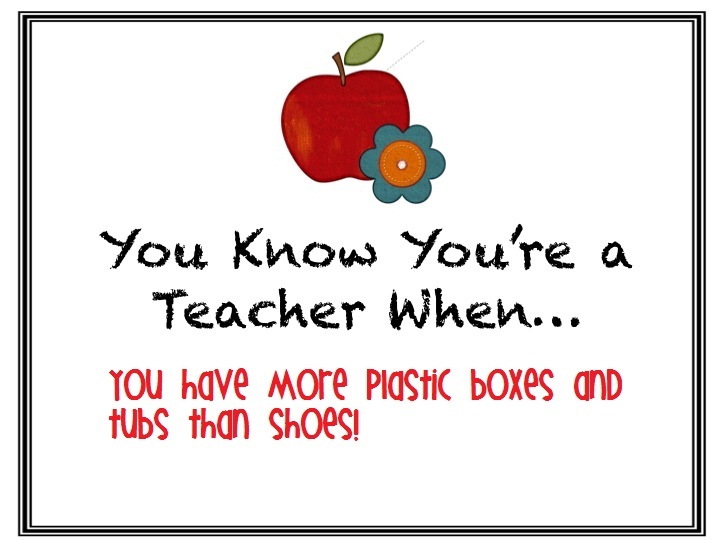 Anyhow, I have started sorting through boxes and boxes of resources and laminated centers and games. 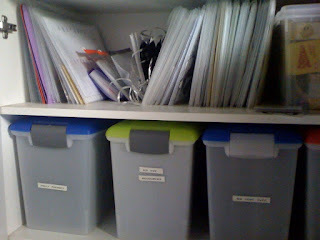 I want them all organised in easy-to-lift file boxes. I had them in big boxes in the classroom, but found these smaller boxes at Big W recently, and they have a handle on the top. Much easier to lift, and I will be able to make each one specific for a strand of each subject. For example, I would like one for "Addition with Numbers Less then 10". They sit nicely in my garage cupboards and when I am back at work, I will be able to grab a suitable box when I am working with a specific small group of students. 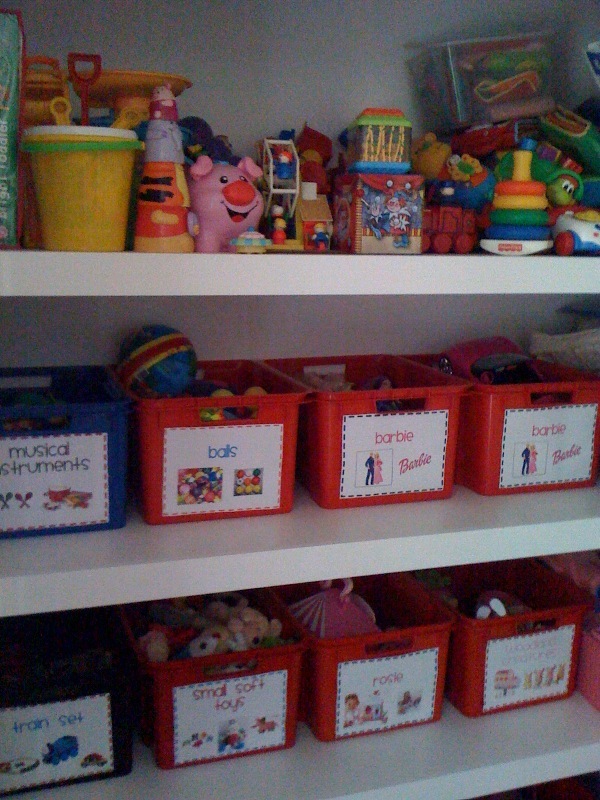 I have also been sorting my daughter's toy cupboard. I want it to be easy for her and lovely little darlings that come to play with her - TO PACK AWAY! So, the labelled boxes have been a hit! Not only can she pack away faster, she is re-engaging with toys she had forgotten about. It is not finished, as you can see by the top shelf, but I will get there. One half of me is highly organised, and the other half of me likes to jump from job to job, so I always have a zillion things on the go! Hello Friday! What a long week! So much is happening, and sadly my pond-erings have had to take a back seat. I am at the 35 week mark in my pregnancy, and baby is making his/her presence well and truly known! I am still amazed that soon I will have a new person in the house!